Amritsar: Worship has resumed at the Golden Temple in Amritsar, where at least 12 people were injured this morning when two groups clashed inside the premises. 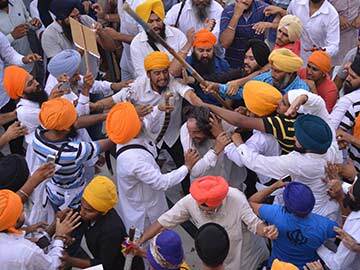 People were seen brandishing swords, spears and sticks and they chased each other outside the Akal Takht building of the complex. Many others were seen running for cover. Seven people have been arrested by the police. The clashes reportedly followed an altercation between members of the Shiromani Akali Dal (Amritsar) and those of the Shiromani Gurdwara Parbandhak Committee or SGPC task force during a ceremony organised to mark the 30th anniversary of Operation Bluestar. Sources said Simranjit Singh Mann of the Shiromani Akali Dal (Amritsar) wanted to address the gathering, but his demand was turned down by the Akal Takth Jathedar or high priest, resulting in angry clashes that lasted for close to half an hour. Some media personnel were also allegedly manhandled. Top SGPC functionaries, including its president Avtar Singh Makkar, and Akal Takht Jathedar Gurbachan Singh were present inside the complex during the clashes. The situation is calm now. SAD spokesperson Prem Singh Chandu Majra said the incident was “unfortunate” and the SGPC would take action against those responsible.